This blog post started as a comment on Dan’s first blog post reviewing and critiquing our Design Process Primer and evolved into a more detailed and complete response. We asked Dan if we could post it as an article on his blog and he agreed – great! To start off we are hugely grateful for the time, effort, rigour and passion with which Dan is driving the conversation about permaculture and ‘design’. We think a lot about design and are grateful someone else has taken the time to provide reflective feedback on our current attempt to capture our understanding of a robust and high quality design process. The fact that Dan is going through this with such a fine tooth comb – “a thorough going over” – is brilliant and we hope it continues to generate reflective critical dialogue, refine and hone our own thinking and understanding of design and contribute to Making Permaculture Stronger (MPS). We have tried to keep our response confined specifically to Dan’s critique, however we do go off track in few places to try and link in other aspects of design theory and practice that we think might be of interest and value to the ‘Making Permaculture Stronger’ initiative. To finish a long winded introduction we want to emphasise the purpose of the design primer. We designed the primer as a high level, loose fit guide to the design process for the purpose of applying it to a wide range of design challenges and contexts. We designed it for ourselves as design practitioners trying to work across a range of fields and as a resource for our design education and training work. It is Instrumental Theory1 which attempts to generalize and codify knowledge as a basis for practical action and is derived from empirical observation and practical experience. We find it hard to disagree with this observation. Dan’s observations about the third quote2 resonate and we particularly like the Christopher Alexander quote – we hope you don’t mind if we use this :-). Victor Papanek was one of our first introductions to ‘conscious’ and ‘ethical’ design and we have held his definition of design core to our design practice and our permaculture training programme. While we have not returned to his work in some time it might be worth noting that this definition reflects Herbert Simon’s well known and much earlier definition of design. Loosely speaking in the 60s there emerged in the western understanding and conception of design two distinct schools of thought. One of these is linked directly to Christopher Alexander and his focus on ‘physical’ form and outcomes as the focus of design and the other to Herbert Simon and his focus on design process and the desire for ‘improvement’ as the focus of design. For us (and in a fair bit of our work) ‘design’ outcomes are not focused on ‘form’. If permaculture design is about more than physical form (which we feel it definitely is) we need a broader conception of design and design process than we feel Alexander provides and we feel Simon, and design ‘thinkers’ that follow in his footsteps, such as Victor Papanek contribute significantly to our understanding of design and design process and we feel it has much to offer permaculture design. Through our work we teach design and work with a wide range of ‘novice’/beginner designers who have no experience with a conscious design process in any shape or form. In this context we find that an easy to understand, structured approach to ‘creative problem solving’ (see below for more discussion on this term) is an effective way to bring people on board and engage in design process. In this light, we think of Christopher Alexander’s work as fairly esoteric and more suitable for an ‘advanced’ audience, or people who at least have some exposure and experience with design process. We mention this now as it feels like Dan’s recent ‘unpacking’ of design process has shone light into the over-emphasis on the head/rational function of design at the expense of a whole-person approach using all of our senses (see below for more detail) and it would be of equal value (we feel) to explore the emphasis permaculture design (and design more broadly) places on form at the expense of non-material/physical design outcomes or achievements. As a side note, the Hasso-Plattner model presented in the link Dan shared in his previous post about DT is only one of many DT process models. DT does not, like most other design ‘disciples’, have a defined or agreed process so while the link he provided is a reasonable introduction to DT, there are many alternative interpretations. Despite its name Design Thinking deliberately attempts to move beyond the purely cognitive/mental realm of design and promotes a more holistic approach to design than is typical today – moving us closer to design as ‘a way of being’. One way in which DT, and related practices in the field of social innovation,7 achieve this is through the explicit attempt to make design less about something professional designers do (almost magically or mysteriously and often removed from the design context) and more about something all of us can practice in our day-to-day lives. However, this isn’t a Mollisonian ‘with a whole lot of information and a Permaculture Design Certificate you are now qualified to go out and redesign the world’, but a more genuine attempt to make design less about designing ‘solutions’ for people and more about designing interventions and conscious experimenting with people. We think quality design often includes empowering stakeholders to be a part of the process through collaborative, participatory or ‘co-design’ processes. This is another reason why at Resilio we value the likes of Herbert Simon, Victor Papanek as well as Design Thinking – they have all contributed to helping reframe design away from a purely professional practice, to an everyday ‘way of being’ and collaborative practice. Dan makes some very interesting observations and we agree in principle that the higher ‘goal’ of design is enabling potential and agree that it should be the ends to which all design aspires. We often talk about exploring unreleased opportunities in our work (but this is not captured in our Design Primer).8 However Carol Sanford’s phrasing is much more eloquent and insightful and captures a deeper structure that design can draw on. However, we have a degree of hesitation / caution about focusing on potential. It concerns issues about understanding potential in the broader interpretation of design and, at the risk of coming across pessimistic, setting false expectations. Enabling Potential – The potential of what and according to whom? How is the potential understood? From a purely rational perspective, the potential of some design outcomes can be precisely determined, for example, from the laws of thermodynamics we can determine the optimum transformation of solar energy to electricity, which can be calculated, and stated matter of fact in advance. The potential of a landscape for another example, which involves ‘natural’ and ‘cultural’ practices involve phenomena that can be objectively evaluated through observation and mapping of existing characteristics and processes, historical events etc., to help determine the potential ‘climax’ ecology. However a wide range of other inputs need to be considered including subjective perception and sensing of the landscape as well as values and behaviours of the people who interact with it. The point here is that the concept of potential very quickly becomes subjective and relative. Said another way, understanding the potential of a place, person, thing etc. becomes increasingly more subjective (and intangible) when the subject of design shifts from purely objective like the solar example cited above toward more subjective phenomena such as a building, a public space, an object, a transition initiative, a business start up or a local currency. As an example of one of the ways we approach this challenge in our work is through the creation of a ‘vision’ or more accurately a ‘shared vision’ to full the space for the project potential. How you might go about developing a shared vision is a topic for another day and we assume that this is a small part of the space Dan will be covering when he gets to his series on Holistic Management – Dan? Finally, and particularly with design in the sociosphere9 a shared vision often holds the space of the project potential and like a vision, in an unknown unfolding process, the potential should be ‘held lightly’ allowing it to evolve, adapt and respond to change. The adaptive cycle exhibits two major phases (or transitions). The first, often referred to as the foreloop, from r to K, is the slow, incremental phase of growth and accumulation. The second, referred to as the backloop, from Omega to Alpha, is the rapid phase of reorganization leading to renewal. During the slow sequence from exploitation to conservation, connectedness and stability increase and a capital of nutrients and biomass (in ecosystems) is slowly accumulated and sequestered. Competitive processes lead to a few species becoming dominant, with diversity retained in residual pockets preserved in a patchy landscape. While the accumulated capital is sequestered for the growing, maturing ecosystem, it also represents a gradual increase in the potential for other kinds of ecosystems and futures. For an economic or social system, the accumulating potential could as well be from the skills, networks of human relationships, and mutual trust that are incrementally developed and tested during the progression from r to K. Those also represent a potential developed and used in one setting, that could be available in transformed ones. Adaptive cycles are nested in a hierarchy across time and space which helps explain how adaptive systems can, for brief moments, generate novel recombinations that are tested during longer periods of capital accumulation and storage. These windows of experimentation open briefly, but the results do not trigger cascading instabilities of the whole because of the stabilizing nature of nested hierarchies. In essence, larger and slower components of the hierarchy provide the memory of the past and of the distant to allow recovery of smaller and faster adaptive cycles. A nested hierarchy of adaptive cycles represents a panarchy. Using this model to illustrate, in exploitation or re-organisation stages a focus on potential makes a great deal of sense as the potential for system change is much greater. During the release or potentially even conservation stages focusing on problem solving is likely more appropriate. Furthermore the type of system and where in the life cycle of that system you are designing will impact significantly on the potential of that system which can in some contexts literally change day to day. In a complex system the potential is dynamic, constantly evolving and often practically elusive which makes designing for potential practically implausible. Put another way, the nature of complex systems suggest that a system has to be ready for change. A good example of this is the Occupy movement, the so called Arab Spring, ‘Brexit’ and the election of Donald Trump – all social phenomena that have emerged out of a complex system at a particular time during the system’s cycle. The occupy movement was a response to the GFC and we don’t see any evidence of a similar international movement emerging until another similar event creates the condition for that potential to be realised. We also just wanted to offer a quick response to the following excerpt, which didn’t fit cleanly into the other observations Dan offered. We agree there is an issue with an overly rational approach to design. However our experiences and observations suggest, as noted above, that framing design as a sequence of phases (that don’t always occur in a linear or even logical sequence) is an effective way of helping people with a wide range of understanding and experiences to grasp the core insight that design is a process rather than the drawing, plan, building, garden, artifact etc. An analogy might be useful – Design can be thought of a little like a journey from one place to another. Whether you plan it completely in advance or you just go where the wind takes you, you will inevitably have a beginning, a middle and end to that journey. Let’s focus on the emotional experience of the journey here – the excitement and anticipation typically experienced at the start, the doubt, feeling ‘out on a limb’ and out of one’s comfort zone might be typical of one’s emotional field somewhere in the middle, particularly if this is a journey you’ve not made before, and the sense of gratitude, achievement, completion or increased wisdom or growth that might happen at the end are all part of a wider pattern of journeying. While everyone may not experience all of those things along the way, recognizing that there are typical stages on a journey and anticipating what one might experience at different stages can be quite useful for novice and seasoned travellers alike. And let’s face it, some of us travel better than others, so trying to learn from the patterns that emerge out of other people’s journey and even mimic those who travel well seems like a useful thing to do. This is the value we see in attempting to map out the journey of design and recognise the predictable patterns and stages along the way. Furthermore, our cultural predisposition to using our heads as the primary means to reflect, make meaning, and capture insights and understanding means that it is almost inevitable that our design models will bias rational operations to map the journey of design. Design as an ongoing process which is a hybrid between the method Christopher Alexander’ maps in his book Notes on the Synthesis of Form and a design thinking model. We also like the clear visual reference to the infinity symbol and the adaptive cycle. Thanks for the link Dan! And this one – we don’t know the original source of this diagram however it does seem to resonate with many people’s experience of the design process. This is opposed to Critical Theory which resists and challenges taken for granted ways of thinking and puts forward alternatives, of which Making Permaculture Stronger is a great example, and Interpretive Theory – which is intended to help better understand a situation without necessarily changing it. “design is an interactive, imaginative process for creating something that has never existed before”. Birkeland, J. (2008). Positive development: From vicious circles to virtuous cycles through built environment design. London UK: Earthscan. For starters Design Thinking has all the hallmarks of being a fashionable tread that will no doubt be out of favour in a few years’ time. This is why we are interested in design process. One could argue that permaculture has its own version of this embedded in its own practice through the application of the ethic of People Care but we think DT’s use of empathy explicitly embeds People Care in the design process. The sociosphere describes the realm of human society, culture and psychology – it includes all socio-cultural, political and economic systems and structures that define and influence human behaviours and interactions in any given culture and society, as well as the relationships and interactions between them. For example adaptive cycle of complex systems was originally developed by C.S Hollling and L H. Gunderson under the name Panarchy – https://en.wikipedia.org/wiki/Panarchy. 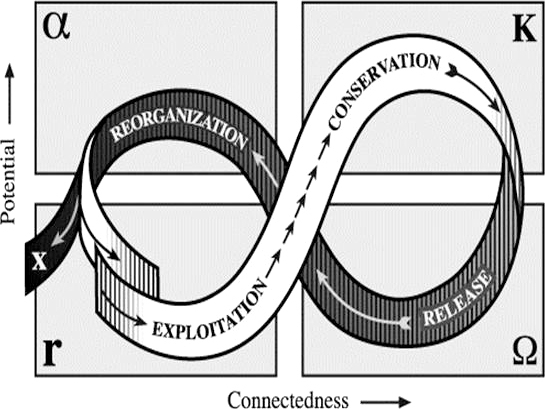 David Holmgren refers to it as the Four Phase Model of Ecosystem Change in Permaculture Principles and Pathways Beyond Sustainability and David Flemming refers to the model and the Wheel of Life in Lean Logic. This is just a quick, self-indulgent brain-splurge on the rational bias in design, and on the previous post’s question about whether to stick with the word “design” at all. Anyway, when the the less rational, more juicy-feely, pre-conscious stuff is appropriate, it happens in step one: perceive the whole (with your whole squishy mind-body), and let the best transformation come to you. I see “design” coming into it like this: depending on how consequential the transformation is, something may need to be done between these two steps (perceiving and transforming). If the whole we are transforming is, for example, a flow of improvised music (very low on any scale of permanence), nothing need be inserted here, perception and transformation can be a virtually undifferentiated whole. If what we are transforming is part of a landscape that we’re turning into a large dam (high on scales of permanence), a crinkle in the perception-transformation whole suggests itself: there needs to be something between them to prevent unintended or undesirable consequences. What that actually is could be any of a number of cognitive processes: engineering, permaculture principles, holistic decision-making tests, financial calculations, even rational reminders to check in on our emotions. I guess we can either conceive of design processes as mental models to apply alongside these others, or if we really want to elevate its importance, we can think of it as the tool that allows us to choose the best mental models to use in this particular transformation. So in the example of a dam, our deep perception of the people and the site suggest to us a water feature, so now we do some design: we map, mark and draw, we calculate capacity and cost, lay out water levels for the earth mover, and so on. Then we do the transformation, then we go back to perceiving the whole. So I see design as a small part of the generative transformation as a whole. It’s okay that it’s biased towards the rational because its role can be to serve the warm, complex, touchy-feely stuff with whatever cold, complicated, rational process will be most helpful in getting the overall transformation right. And why not just call the whole generative process “design”? Because the word already has a meaning, and that meaning (as you’ve so ably demonstrated on MPS) is antithetical to generative transformation processes. So if we relegate design to a useful little piece of the process, it gets to keep its meaning, and we can draw on it whenever we need to while we lovingly generate wholeness-preserving transformations everywhere. Or something. Sorry that got so long, this stuff gives me designarrhea. Beautifully put Alec! Or something indeed. It is a pleasure to read someone thinking/writing so fluently about this stuff. Hi Dan, thanks for the reply! As always, you strike a great balance between deep thinking and clear expression. Unfortunately for you, I’m going to reply with some half-baked thoughts, because it helps clarify my thinking and will hopefully draw out some more of your thinking for us to enjoy. I agree fully with the second paragraph of your reply, and I think what you’re describing is sort of the ideal state for a generative process. But I do take issue with stretching design to encompass the whole process, and I think design itself might in fact be permaculture’s Type One Error (which you’re having to expend so much energy to correct). Leaving aside for a moment the more theoretical concerns of what design is and what we’re actually doing in a generative process (which I could uselessly waffle on about forever), I have some more down-to-earth concerns. I’m a beginning farmer working on rented land. There’s a lot of us in this situation, and I don’t thing I’m the only one who started farming because of inspiration from permaculture, but who at the same time finds permaculture close to useless in making decisions about my farm enterprise. On a theoretical level, reading Allan Savory and Christopher Alexander made me feel that design is in fact an error in itself, and without design permaculture basically offers nothing. Since I’ve started my own farm, the practical realities have pretty much confirmed this. (In fact, your efforts on MPS are the only thread keeping me attached to permaculture at the moment). Part of the reason for this is that when land tenure is insecure, you work exclusively at the low end of the scale of permanence, where (as I’ve argued above) you don’t need design very much: it’s lean, agile, test-driven, fail-fast, quick-feedback stuff (think pastured broilers or intensive salad crops). I constantly need to plan and make decisions, but if the verb of permaculture is to design then it doesn’t help me much with these (unless you totally change its meaning, as suggested by you and many other deep thinkers on this). I do, however, find Holistic Management very helpful. In an odd way, I also find Alexander’s work helpful, because of the simplicity and near universality of the differentiation, BNS and gradual stiffening approaches. Always hanging just out of sight, I also have a cloudy vision of some simple process that unites all these modalities in a useful way, which I’m sure is what we’re all groping towards. I would love it if permaculture became that umbrella process, but if it defines itself as design, I don’t think it will, for two reasons (both of which I think you’ve already alluded to, but don’t really feel resolved to me). One, we would have to change the meaning of design to encompass all conscious action (as suggested in the above blog post). When I try to apply this kind of definition to my life, it feels pretty useless. Maybe when I do some budgeting work in a spreadsheet, I’m actually designing a budget or designing my expenditures. But it feels more useful to say that I’m budgeting (which is a really-existing, practical procedure). It’s conscious, future-oriented action, but it’s not design. And if I’m doing it in the context of a holistic or ecological understanding, then it can be permaculture, even though it’s not design. Two, if design just becomes any conscious action, we lose the use of the word for those things that it really applies to. When I do a drawing of a chicken tractor I’m going to build, it’s a useful application of design that has practical benefits, like knowing what materials to buy. Again, what might make it permacultural or generative is that I do it within a context of a holistic understanding. But it’s still design as a subsidiary activity, in the same way that budgeting, planned grazing, composting, and tooth brushing are all potentially useful actions to perform within a holistic context. I’m guessing here, but I feel like this becomes even more important if we want people in various design professions to embrace permaculture. If they they have to abandon their well-developed (if flawed) understandings of design and replace them with something new, they might be less likely to come along than if they can place their existing understandings within a more holistic context. In this way, for example, architects, engineers, landscape designers and farmers could all feel that they are performing their professional activity within the context of permaculture, rather than replacing their practices with a new process. One immediate benefit of making design a subsidiary, optional part of permaculture is that the many of us proceeding with ecological regeneration by starting on rented land with Salatin-style enterprises or annual market gardening can feel like we are still doing permaculture. We’re not designing much, but we’re constantly performing transformations of our life-business-wholes. These transformations are necessarily low on the scale of permanence, but they are guided by the holistic vision and ethics of permaculture, and we hope they will gradually stiffen into more mature wholes. Maybe someday we’ll even need a design procedure that tells where to plant big trees. In the meantime, it would be nice if permaculture could embrace these activities even when they don’t include design. So to summarize all this guff: permaculture feels most useful to me when it can be the broad holistic process that includes useful subsidiary procedures. The basic process is to perceive the whole as fully as possible and transform it incrementally to become more alive. Within this process we may draw on procedures such as design, budgeting, surgery, meditation, breakdancing etc. Permaculture is less useful when it focuses on design as the thing we should be doing, because most of the time it’s not the thing we’re doing. OK, all finished. Apologies for spraying this mess all over the place, if nothing else it’s been therapeutic for me. I’m responding here to a question raised in the Pattern Science Community at https://www.facebook.com/groups/1717511025189767/permalink/1992693767671490/ . > Mr Alexander’s concepts on the “Nature of the Order / Universe” are predominantly filtered through the lens of the built environment and his completed works have only ever been applied to built form. If this is not the case I would love to be pointed in this direction, if not, I can see value in expanding Mr Alexander’s works and applying it to non-physical form. In my opinion, a lot of the questions on applicability of Christopher Alexander’s ideas go to philosophical roots. If permaculture is seen as a human activity, then it not only has material aspects, but also non-material aspects. The systems sciences open up design in this way, e.g. “Social Systems and Design” | Gary S. Metcalf (ed) | 2014 | Springer at http://doi.org/10.1007/978-4-431-54478-4 . Christopher Alexander himself worked on the built physical environment, and declined to extend his work to other domains — in particular, with the 1996 OOPSLA speech at https://ingbrief.wordpress.com/2014/04/06/19961008-christopher-alexander-patterns-in-architecture-oopsla-96/ — except to exhort software developers to use pattern language not just to write code, but to improve the world. Some of my research has been on the design and pattern language, in particular towards a service systems orientation (i.e. customer/consumer oriented, related to outcome) over a production orientation (i.e. output). The fullest description of that, to date, is presentation of a paper at the PUARL 2016 conference, see http://coevolving.com/blogs/index.php/archive/pattern-manual-for-service-systems-thinking/ . In a footnote to The Nature Order, Book 4, The Luminous Ground (p. 336), Christopher Alexander recalls that Bohm “declared that in his view this material was the most interesting. … somehow he though the conception of matter contained here was the most significant aspect of these books. It came closer, perhaps, to providing a complement to his own views”, in his meeting over 2 days in 1986. This, to me, indicates the orientation of Alexander’s worldview towards physics. The direction that I’ve been encouraging, for a generative pattern language on services systems, suggests an alternative view compatible with the ecological epistemology of Gregory Bateson. This steps outside Alexander’s work within a single paradigm, towards a multiparadigm inquiry, see http://coevolving.com/blogs/index.php/archive/multiparadigm-inquiry-generating-service-systems-thinking/ . I’ve only gained a deeper appreciation of this perspective through the ecological anthropology of Tim Ingold, e.g. https://ingbrief.wordpress.com/2016/12/10/20161210-0915-tim-ingold-thoughts-on-movement-growth-and-and-anthropologically-sensitive-isorganization-studies-ifip-wg8-2/ . In the domain of design, Susu Nousala (Tongji U., Shanghai), Peter H. Jones (OCADU Toronto) and I have a paper in final review for FORMakademisk following through from a RSD5 workshop described at http://coevolving.com/blogs/index.php/archive/some-future-paths-for-design-professionals-designx-and-systemic-design/ . Since the focus of this blog is on permaculture, and this blog entry on the intersection with design, there are some deeper philosophical questions that could be worked out. Huge thanks for your comment David. I’ll reply properly when I’ve followed up some of your links. I have one burning question though- do you know if the Alexander-Bohm dialogue was recorded in any way? I would kill to get access to it! @Dan, the most that I’ve found on Christopher Alexander visiting David Bohm was the description in the footnote in The Luminous Ground (p. 336). Alexander cites very few references in his writings. My critical appreciation of the foundations of generative pattern language have had the benefit of conversations with Alexander’s graduate students (Hiroshi Nakano, Max Jacobson, Howard Davis) at PUARL conferences. I’ve been so busy that I haven’t had the opportunity to fully process the audio recording of the workshop that is described at http://coevolving.com/commons/20171021-exploring-the-context-of-pattern-languages . I’m launching a book in a few weeks, so that the blog post with the audio recording may be more than a month before it turns up at http://coevolving.com/blogs/ . Thanks David – the links you sent through look great – I’ll get back with any questions etc once I’ve had a chance to delve into them. Finn actually challenged me on your first point and I should own this and it might be worth sharing a summary of some of the points that were raised through our conversation. While I understand it is “a little unfair” to use a quote from the first sentence of Mr Alexander’s first book his subsequent works are overwhelming focused on the built environment – objects and space – “The Timeless Way of Building”, “The New Theory of Urban Design”, “The Nature of Order: An Essay on the Art of Building and The Nature of the Universe” (actually four very substantial books – not what I’d call an essay) to name a couple of title off the top of my head. I also appreciate the that Mr Alexander’s work is profound and many of his deeper messages are probably beyond my capacity to engage with meaningfully, and I have not yet given these ideas the time they deserve – particularly his “more central concepts of life, wholeness and beauty” (you have motivated me to get my copies of the Nature of Order back off of the shelf and get back into them). However, my current understanding is that while Mr Alexander has made profound observations of a very wide range of phenomena outside of the built environment to explore his conception of “wholeness” and the “Living Process” and there is no block or barrier to using this conception to generate other kinds of forms – as far as I am aware, Mr Alexander’s concepts on the “Nature of the Order / Universe” are predominantly filtered through the lens of the built environment and his completed works have only ever been applied to built form. If this is not the case I would love to be pointed in this direction, if not, I can see value in expanding Mr Alexander’s works and applying it to non-physical form. In the meantime, I have four very large books to reacquaint myself with. PS – As a somewhat humorous side note – we too quite like the phrase “exploring unreleased opportunities”, however it was meant to read as the much less poetic “exploring unrealised opportunities” 🙂 Not sure which phrasing we will use from now. Huge thanks to you Finn and Gary for penning Making Permaculture Stronger’s first guest post! I’m loving the feeling of relaxing my grip on the reigns here and am happy to report that several guest posts from others are already in the release queue. Now I can’t resist a few comments on your lovely and much-appreciated reply to the first part of my review of your primer. While Alexander emphasised form as the object of design process in his 1964 book Notes on the Synthesis of Form (which was a thesis he wrote as a student in his twenties), he to my knowledge gave it less emphasis in the huge collection of books he subsequently authored (not to mention his marked decrease of emphasis on design at all). For the bulk of his career as a practicing architect, he instead emphasised what he called the quality without a name, wholeness or living structure as the outcomes of what he called living process (as opposed to design process). What I’m getting at here is that it feels a little unfair to me to judge someone’s work by extrapolating from one tiny, early bit of it (especially when he explicitly rejected many of the ideas therein once he starting practicing as an architect and discovered their limitations). That said, he did continue to use the term form here and there, and I myself have become quite partial to it, perhaps more partial than he was. But here’s the thing. Though Alexander was an architect interested in how we go about creating buildings and other solid objects (among much else), I have never sensed any block or barrier in using his conception of living process to generate other kinds of form in the dictionary definition of “the shape and structure of something.” To me a book, or a dance, prayer, or poem, or a day has a form, in the sense of a format, shape, configuration, arrangement, etc. When you say “For us (and in a fair bit of our work) ‘design’ outcomes are not focused on ‘form’” – I am therefore left scratching my head trying to imagine a design process outcome that is completely formless. In my experience all design process starts with a whole-and-its-parts, which is another way of saying a form or format (in the sense of something with preexisting internal differentiation), and further transforms or differentiates it in one direction or another. What I’m getting at here is that I’d be cautious about equating “form” with “solid static physical three-dimensional object” and using this as an argument for writing off words like “form” prematurely. If something is formless, as in completely homogenous, then, well, I’m not sure it even is a something any more. It is a no-thing, and it would feel strange to say that the objective of a design process is nothing! I’m sure this is not the place to get into this matter, but I also think we need to be careful here not to uncritically accept a dualism between the physical and non-physical worlds. This is kind of hard to do, given the deeply buried dominant narratives of our culture, and in Alexander’s case (not to mention other thinkers such as David Bohm) required an attempt at an non-mechanistic alternative cosmology. The upshot is that I think these matters are more nuanced than they might seem at first, and that unless some comprehension of Alexander’s later and more central concepts of life, wholeness and beauty are evident I’m not sure how fruitful this line of thought is (though I am curious to learn more about Herbert Simon and Victor Papenek’s work in terms of what they have to offer and for the record while I can hardly overstate the extent of Alexander’s work on my own, I do see him as one of many true-but-partial influences as opposed to someone I want to dogmatically imitate or impose on others.). Good to know – again look forward to learning more about these “mode-of-being” and “collaborative practice” aspects to design thinking. Got some links to any concise online summaries or introductions (or, if not, books) for me? “exploring unreleased opportunities” – lovely phrase! I”d like to see it in your primer! I also think this adaptive cycle concept has much value to offer – thanks for mentioning. Just a quick comment to share that I’m personally drifting away from the word “vision” or “shared vision” toward “intention” and “joint intention.” Be interested to have other’s thoughts on this but I’m finding the word vision too caught up with where it came from – the verb “to see” where in this image driven and hungry culture of ours I don’t want to know what people want to see as a first step. I want to hone in on how they want to feel which equally involves all the other senses too. I really like what you say here and rather than commenting now will work this into the second instalment of my review, which is well under way, and in which I look in detail at your actual process diagram. Finally – I like your concluding misquote – much better! Cheers guys for this interchange and for the contributions you are making toward a stronger permaculture, and I look forward to where our dialogue evolves to from here (at least I hope it deserves to be called a dialogue – I am certainly finding myself in new places including some significant new insights I’ll share in my next review instalment! ).